Some time back I went into the Ship Inn and it seemed to be drifting rather listlessly, lacking purpose or promise. A once favourite student haunt, the lease was available for a new tenant and there seemed to be little effort, being made to get the place going. But last Friday after a few pints in the Bitter Suite (see previous post) and a few more in the Mad Ferret, my mate Chris and I were stumbling back home, when the Ship docked in our path. An acoustic performer was knocking out a few tunes and the assembled crowd seemed to be appreciating his efforts. Having decided I needed to rise before midday Saturday I was not keen to go in. But after a moment’s arm twisting, I agreed to listen to a couple of songs and ‘then we’d be off’. But seeing they were now serving Hobgoblin, I quickly revised my plans and we were soon settled for the rest of the night. Despite approaching the small hours, it was clear there was more happening than the last time I was in. Two good live acts kept people entertained when other pubs were closing and with a supply of real ale my plans for Saturday were quickly abandoned. 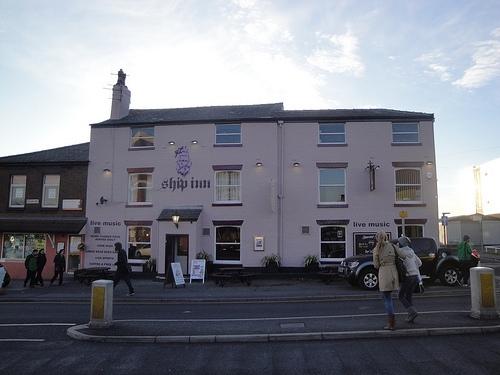 Whenever I have spoken to students who have studied at UCLan in the last decade, they have almost all claimed the Ship Inn had been as important to their student experience as the university itself. And with the next intake of students arriving in Preston next month, there may well be hundreds more ready to climb aboard.